To Peking Chef Chinese and Japanese Restaurant, Columbia, MD. 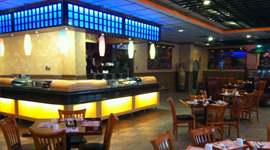 Located at 6420 Freetown Road, Columbia, MD 21044, our restaurant offers a wide array of authentic Japanese or Chinese dishes, ranging from traditional dishes such as miso soup, house salad, szechuan beef, boston roll. Try our food and service today. Come in for a Japanese or Chinese Lunch Special or during evenings for a delicious Authentic Japanese or Chinese style dinner. You can also online order your favorite food for take out or delivery.